It is the Franciscans that started this tradition back in colonial times. Nowadays people take their pets to church for a blessing. The priest asks God for the health and fertility of the animals. 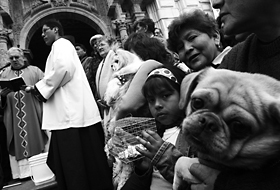 Every October the Church of San Francisco in Lima hosts hundreds of pets, cats and dogs, parrots, rabbits, white rats, turtles, etc. For approximately four centuries 12 million Africans were captured and taken to America and the Caribbean as slaves. Part of the infrastructure used in those days still stand in Badagry. 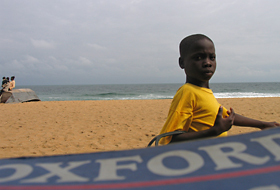 Today Nigeria has 128 million inhabitants from 250 different ethnic groups. It is the most populated country in Africa. In 2005 the Peruvian government approved a budget of US$ 892 millions for the construction of an interoceanic highway that will connect Peru and Brazil. 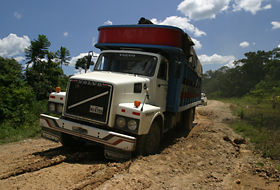 Today, to travel from Urcos to Puerto Maldonado (484 kilometres) during the rainy season can take up to 10 days. Ecologists oppose the construction of this highway due to the damage that massive migration and excessive traffic can cause to the ecosystem.